Interior Secretary Ken Salazar signs off on a program to open up 285,000 acres in 17 “solar energy zones” in six Western states for fast-track project approvals. Secretary of the Interior Ken Salazar signed the Record of Decision codifying the plan in Las Vegas on Friday, joined there by Senate Majority Leader Harry Reid (D-Nev.), proving that even in the face of a recalcitrant Congress, the executive branch has tools to make things happen. There are zones in six states, but that’s a little bit misleading: Of the 285,000 acres, more than half -- 147,910 -- are in California’s Riverside County, which borders Orange County on its western flank and then stretches all the way east across the Mojave and Colorado deserts to Arizona. 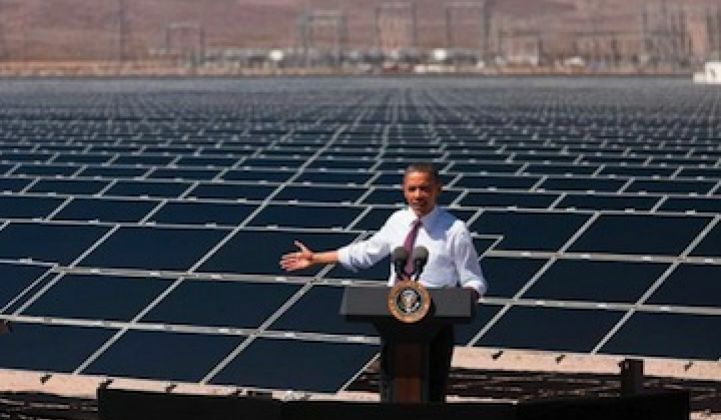 Pre-Obama, no big solar energy projects had been permitted on public lands. But according to the Interior Department, under Obama, 33 renewable energy projects have been approved for construction on or involving public lands, including 18 solar plants, seven wind farms and eight geothermal plants. In May, the first of those big projects -- Enbridge Silver State North, a 50-megawatt solar PV array 40 miles south of Las Vegas -- went on-line.